The rule of thirds is a great tool for composition, whatever your subject matter. Here's how to use it effectively. The rule of thirds – used frequently by photographers – states that if you divide any composition into thirds, vertically and horizontally, then place the key elements of your image either along these lines or at the junctions of them, you’ll achieve a more pleasing arrangement and more interesting and dynamic compositions. Painters and artists use the rule of thirds mostly for landscapes, but it also works for any subject matter, including still lifes, figures and even portraits. The rule of thirds gives you a guide for placing focal points. If you design your focal points according to the intersections of any of the nine rectangles, your picture will have the counterbalance needed to make the composition more interesting and more compelling. You can also design other elements in the picture to lead the eye from one of the focal points to the other, and use the corners to bring the viewer into the picture or keep the eyes moving back into picture again. This kind of eyeflow adds movement and life to any composition. On this page, we'll look at how artists have used the rule of thirds to create dynamic compositions. The rule of thirds is a compositional guideline. Its origins go back to classical and Renaissance paintings, but it is mostly known as a compositional tool used by photographers. This painting by Valentin de Boulogne shows how the main characters are all placed on the upper dividing line, creating a dynamic arrangement of figures. The rule of thirds is mostly known as a tool for composing landscapes. In this painting by Pierre Henri de Valenciennes, the horizon is placed in the lower thirds, and the large mass of mountains and scenery is placed in the left section, to create a more dynamic scene. The main function of the rule of thirds is to help create asymmetric compositions. If the elements in a picture are centred and too balanced, it becomes boring. If the images are offset using the rule of thirds, the asymmetry and counterbalance of elements creates a much more dynamic picture. Another great way to use rule of thirds is to help place focal points. In this portrait painting, the eyes fall on the upper horizontal line and leads to the second focal point in the ear. Other points of interest such as the warm triangle of light also fall on an intersection of guidelines. Eyeflow is another great use of the rule of thirds. 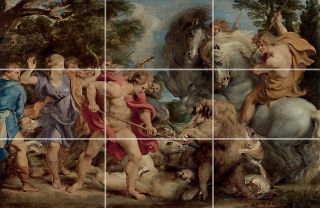 In this painting by Rubens, the main focal point of the boar is placed at an intersection. Secondary points of interest fall on intersections as well and the action of the poses lead the eye from one focal point or intersection to another.